With the clocks going back later this month, SERP is reminding drivers and pedestrians of the heightened risks pedestrians face in the hours before sunrise and after sunset. SERP is running a burst of its ‘No Excuse’ campaign from 1 October to coincide with the end of ‘British Summer Time’ on Sunday 25 October. 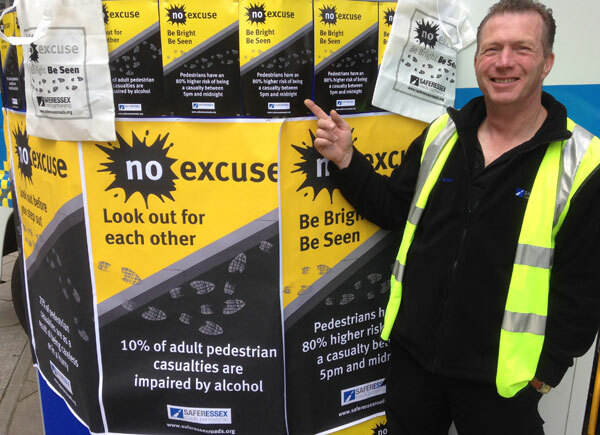 ‘No Excuse’ aims to promote awareness among all road users of the increased risk of adult pedestrians being involved in a collision when they are in a hurry, travelling in the dark or while impaired by alcohol. Using the three straplines ‘Be Bright Be Seen’, ‘Look out before you step out’ and ‘Look out for each other’, the campaign reminds pedestrians and drivers that pedestrians have an 80% higher chance of being a casualty between 5.00pm and midnight. The campaign will also highlight that 25% of pedestrian casualties in the SERP area are as a result of the pedestrian being careless or in a hurry – and 10% of adult pedestrian casualties are impaired by alcohol. A report published by PACTS in 2013, called ‘Stepping Out’, showed that nationally 68% of all pedestrian casualties are adults. The report identified that pedestrians were at highest risk on weekend evenings after consuming alcohol, and during late evening/night time. Within the SERP area, Colchester, Basildon and Southend-on-Sea are the areas where adult pedestrian casualties are most prevalent. SERP data shows that 43% of pedestrian collisions involve the injured pedestrian failing to look properly; 14% involve failure to judge the path or speed of a vehicle; and 10% involve crossing when masked by a parked or stationary vehicle. Matt Clarke, SERP’s Communications Officer, said: “We’re asking pedestrians to take extra care with the onset of darker evenings, and drivers to pay special attention to pedestrians at this time of year.